The following information was provided by Deanna Power, Community Outreach Manager for Social Security Disability Help. If you or someone you love has been diagnosed with breast cancer, there may be resources available for your family. Advanced, recurrent, and treatment resistant forms of breast cancer “automatically” meet the Social Security Administration’s (SSA) requirements for receiving disability benefits. When breast cancer is caught early, hasn’t spread, or is highly treatable, it can be more difficult to receive a disability approval, but it is still possible in some cases. Social Security Disability Insurance (SSDI) pays benefits to disabled workers, provided they have sufficient work credits available at the time they become disabled. Credits usually accumulate at the rate of four per year of employment, with between 20 and 40 necessary to qualify. 40 work credits may seem overwhelming, but don’t worry—So long as you’ve worked just part-time most years of adulthood, you’ll qualify for SSDI. Supplemental Security Income (SSI) is a need-based program with strict income and other financial eligibility rules, but there are no work credits necessary to qualify. Whether you meet the eligibility rules for one or both of these disability programs, benefits are paid monthly once you’re approved. After you submit your disability application to the SSA, it’s forwarded to a Disability Determination Services (DDS) office for a thorough review. Here, a specialist is assigned to your claim, and he or she compares your application, medical records, and other evidence with the SSA’s standard disability listing. This listing appears in the Blue Book, a manual of recognized impairments and the medical evidence required for proving a severe disability with each condition. Carcinoma of any kind that has spread or metastasized to the skin, chest wall, internal mammary nodes, or to regional or distant lymph nodes. Carcinoma of any kind that has returned after initial treatment, except when the cancer is a “local cancer” that goes into remission after anticancer therapy. Lymphedema that results from your surgical, radiation, chemotherapy, or other anticancer treatments. With an advanced breast cancer or a more aggressive form of carcinoma, like small or oat cell cancer, you additionally qualify for expedited review of your claim under the SSA’s compassionate allowances (CAL) program. This means that your claim could be approved in as little as 10 days. If you qualify for benefits with secondary lymphedema, then you are eligible to receive benefits for one year after undergoing your first lymphedema surgery. Your continued eligibility will be determined after 12 months, when the SSA reviews your new medical records. 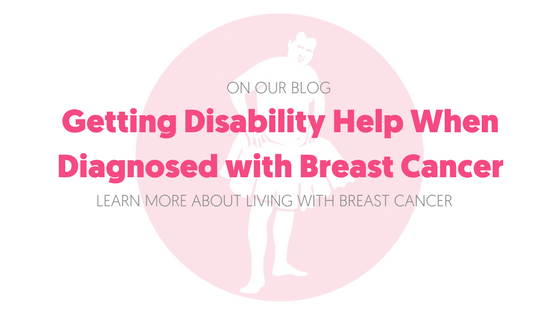 Although it’s more difficult, it is possible to qualify for disability benefits even if you don’t meet the breast cancer listing. If you have lasting complications and severe functional limitations from your cancer or cancer treatments for at least 12 months, then you may still prove you’re unable to work by going through an RFC or residual functional capacity evaluation. This is a thorough questionnaire used by the SSA to determine if you’re unable to earn a gainful living (at least $1,200 per month in 2017) due to your breast cancer and its treatments. Just keep in mind that this process isn’t always successful, and many applicants are initially denied benefits. If you’re denied, you can continue to fight for an approval by filing an appeal online. You can apply for SSDI online or at your local branch office. If you’re applying for SSI, a trip to the local office is necessary, since a personal interview is the standard application method. No matter how you decide to apply, consider reviewing the SSA’s disability starter kit for more information on what evidence, documents, and other information you’ll need to gather for your application. This will ensure you submit all necessary medical and occupational evidence and give you the best chance of approval! ThIS information was provided by Deanna Power, Community Outreach Manager for Social Security Disability Help, a resource whose aim is to assist people at all stages of the Social Security Disability application process, from initially applying, to keeping benefits after being approved. It is not affiliated with the Social Security Administration.